I would call this Instant Godhumai Dosa recipe aka “karacha maavu dosa” in my place as a real life saver. 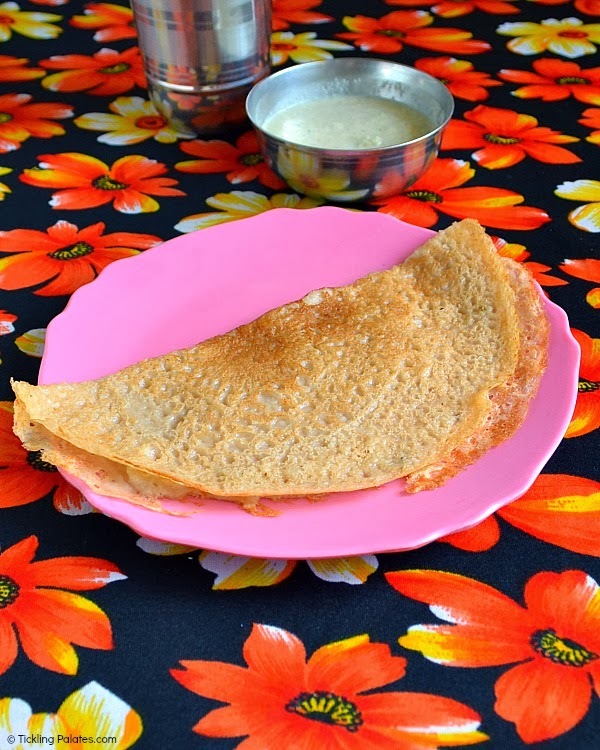 When you are left with just a 2-3 ladles of dosa batter with no idea of what do make for breakfast or dinner, you can use it for making this Instant Whole wheat flour dosa (Crepes) without wasting that left over batter. Even if I do not have dosa batter, I use a small amount of rice flour to make this dosa as it prevents the dosa from being slimy, also the edges come out crisp like I always prefer. 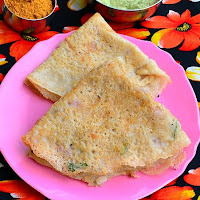 You do not have to waste time for grinding the batter or wait for it to ferment, but you have your meals on the table in under 15 mins with this Instant Dosa version as they so quick and easy to make that is light on the stomach. Finely chop onions, green chili, curry leaves. Crumble the onions with your fingers well. This will separate the onions and prevent it from stacking at one place while spreading the batter. In a mixing bowl, add wheat flour, rice flour or the left over dosa batter, water (1 cup approx.,) salt and mix well without lumps. The consistency should be thin. To this batter add chopped onions, cumin seeds, curry leaves, asafetida, mix well. Heat a girdle and when its hot, add a ladle full of batter and spread it well all around with the ladle (6 inch diameter approx.,). Drizzle a few drops of oil all around and let it cook for 1 minute or till it browns lightly. Flip it upside down and drizzle some drops of oil around and let the other side cook as well. Fold and transfer to a plate and serve with coconut chutney and idli milagai podi. My kids do not like eating the dosa with onions and curry leaves as find it difficult to pick it up, so I make them plain dosas and later on add the onions and make it for myself. You can reduce the water thereby making the batter thick and making pancakes (Oothappam) instead of thin dosas (crepes). If you like them plain, feel free to avoid the onions, cumins and curry leaves. This month’s Palooza in a Pan will have myself, Anusha and Roshni making different types of Dosas. So if you wish to add more dosa recipes to your menu, do not forget to check us out. I tried this and it came out really well. I added tomato, yogurt and ginger to enhance the flavors.